Today’s $17 million question: how did school boards become the must-have accessory for the donor who has everything? That’s the question that Jack Schneider and I put to researcher Rebecca Jacobsen, who has been studying the role of big donors in school board races across the country. 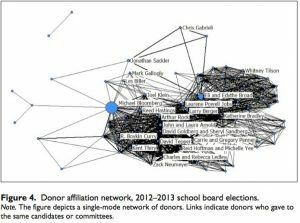 Jacobsen walks us through the emergence of a certifiable trend: big money influencers *nationalizing* school board elections in an effort to force through a familiar bundle of education reforms, often crowding out local priorities and candidates. You’ll recognize plenty of familiar names on the donor list—and they certainly recognize one another. As Jacobsen and her colleagues demonstrate in this handy image of their findings, these big spenders are a tight knit club. It’s Have You Heard #19! Full transcript below. Welcome to another edition of Have You Heard. I’m Jennifer Berkshire. Jack: And I’m Jack Schneider. Jack: They’re going to fall asleep. Jennifer: They are, people think that school boards are so boring. Jennifer: Practically types itself, but what’s so interesting when you look at education history, which I know that you often do, being an education historian, that school boards have been a topic of hot debate going back almost as long as we’ve had schools. And in fact, a lot of the heated back and forth doesn’t really sound so different from what we just saw in Los Angeles, for example. Jack: It’s just a little more old timey. Jack: I thought you were climbing into the time machine this week. Jennifer: I’m hoping that you’ll climb in and do us the honor of walking us through what school boards are. Where did the idea come from, and why are they so often accompanied with this sort of heated back and forth about who gets to speak for what happens in schools and who oversees them? Jack: Sure, before I do that I just want to frame this as a way of seeing something that we see over and over again in education policy, particularly in the debates around educational policy, which is a kind of messy aspect, or imperfect institution embedded in American public education, which is often presumed by critics to be a kind of intentional and deeply flawed aspect of its design. It wasn’t designed particularly intentionally. The flaws are actually the product of a kind of steady evolution and negotiation around a persistent dilemma, which is a dilemma around how are we going to govern these things? That actually, I think, if you look closely at them reveal just how complex the issue is rather than revealing a kind of simple issue for which there is an obvious solution, that bureaucrats have failed to recognize. So with that, maybe I’ll cue up the time machine. I am back in the 18th century. I could have even gone back to the 17th century since we’re recording from Massachusets and there were public schools back then, but here in the 18th century there are no school boards, so what I’m seeing are a few local schools that are run locally, more or less autonomously, by the educators who work there. There really aren’t many educators in the building. There’s the principle teacher and the other teacher. Jennifer: And are you talking about the first 18th century charter schools then? Jack: The 18th century charter schools, which had all of these autonomies from bureaucracy. Again, you’re sort of pointing out something interesting in that the structures that grew up around these autonomous schools were not initially placed there. And so we end up with the district evolving in the 19th century, and with school boards evolving in the 19th century, which we don’t see here in the 18th century. We see a number of complaints about this, for instance, that local people who are being taxed don’t have a tremendous amount of say in their public schools and that generally, those who are in charge of making decisions around the schools, local elected officials, have no real expertise in education, nor any particular interest, and education is merely one of a number of tasks that they are stuck with. And so if we fast forward then to the 19th century, what we see during the common school era, which is more or less a decade or two before and after the Civil War, when we see the first real efforts being made to create systems of public schools. The question arose, how are we going to govern these public schools since local tax dollars are being used to fund them, and people are going to want some kind of accountability around the schools and some kind of voice in what they do. This does raise a question about the fitness of local populations to govern themselves, and there have been critics over time who have said, you know, there are 15,000 local school districts. That creates 15,000 chances to get it wrong, and historically, if I were to fast forward to the 20th century, we would see real fights over some of the most contentious wrongs that have been led at the local level. Efforts to segregate the schools or to maintain segregated schools. Efforts to create an unequal educational experience for girls or for students with special needs, the rejection of science, this can all happen at the local level. And at the same time, what we’ve seen is that despite increasing pushes for centralization over the years, and it’s largely across the 20th century that we saw the push for more state power and for more federal power, the public has remained pretty strongly in favor of local control, some measure of local control. And so if we go back to the year 1900, the state and federal government had very little power in public education, a part of that is because they contributed very little in terms of the funding of public schools. But it’s also because the tradition had been of local governance through local school boards. So the median size of state departments of education in the year 1890 was two people. And the US office of education, which then became, for a while, the bureau of education and then later was subsumed by health education and welfare before finally becoming the department of education. Its primary job for most of its existence up until about 1950 was just issuing reports, collecting statistics. And so not only have school boards evolved over time, but there’s also a long and deep history of local governance and education, which is not always unproblematic, but which certainly does have some upsides. Jennifer: Well the topic of our episode today is the present and future of school boards. Specifically how local elections are becoming nationalized as influential donors weigh in with big money. Jack, while you decompress from your time travel, I’m going to play an ad that ran recently in Los Angeles. So this ad came from a pro charter school group called LA Students for Change that was trying to unseat board chair Steve Zimmer. Close to 17 million dollars was spent in total throughout that election cycle, making this the most expensive school board election in US history. Let’s listen. Ad: We’re all mothers with kids in the LA Unified School District. And you should know about school board president Steve Zimmer. Under Mr. Zimmer, the LA Unified School District faces a 1.4 billion dollar deficit. Part of that is the 1.3 billion dollar iPad scandal that he voted for. So Steve Zimmer wants to lay off teachers to save money. While giving big raises to administrators. Mr. Zimmer, that’s just wrong. We need a new school board president, for our kids’ sake. Jennifer: We’re joined now by Rebecca Jacobsen. She is an associate professor at Michigan State University, and an expert on all things big money in school boards. Rebecca, I just played an ad that ran in LA during that city’s recent election. I wanted to give listeners a sense of what a big money school board election sounds like. We’ll come back to Los Angeles a little bit later in our discussion, but I wondered if you could just start out by telling us why donors who don’t live in a community might be seeking to influence something like a school board race. Rebecca: Sure, I think that as we have seen over the past decade or so more of a centralization with more calls for federal involvement in education reform as well as more state involvement in education reform. I think that a lot of the reformers have found that they’ve become stymied at the local level. The local leaders remain really important to the implementation of policies, and local leaders can choose to ignore or change or pick and choose pieces of a reform in ways that have sometimes stymied the advancement of a particular reform agenda. And so I think that there’s an easy thing focus on the local level as a way of smoothing that process and advancing that agenda. Jack: Rebecca, listening to you there talk about the advantage of centralization and of an increase in top down authority for a particular set of influencers, and I’m wondering if you see these folks aligning around particular issues, or if you see connections between and among the kinds of wealthy donors who might gain additional influence from the kind of top down systems that you just described. Rebecca: Yeah, so let me tell you a little about who some of these donors are first, and then I think some of the connections will be a little bit clearer. In our research we’ve looked at all the different campaign contributions that were given, so we looked line by line at exactly who was donating and how much. And we came up with a set of about 96 big national donors, and these are folks that some of us are familiar with, especially when we’re in the education reform world. They’ve often been very influential from a philanthropic perspective. Many of them have created their own education organizations or their education reform groups. These are folks like Reed Hastings of Netflix, who has been really active in sort of reforming education. Laurene Powell Jobs, who is the wife of the late Steve Jobs, who has created her own education reform initiative. Sheryl Sandberg, many of these people are involved in sort of the tech world, and so we see not only connections for regionally, these folks all sort of work and live in the same circles. But then we also see connections that they’re involved in the same charter boards or the same education reform organizations and boards. They often share affiliations beyond just the fact that they’re now donating to the same organizations. Those are sort of the ways that we see these folks interconnect across a number of different ways. Jennifer: You have a great visualization of this in your paper, and it reminded me of how when Jack was a young boy and he loved to play that … Was it called? Jennifer: Pick up sticks, and also the thing where you would run the yarn between your fingers? Jack: Oh, Cat’s Cradle. I still do that. Jack: Should I get a ball of yarn out? Jennifer: You should. But that’s actually all … I’ll include the visual from your paper when we post this because you really get the sense, you see the strands connecting … These people become really thick, and since we’re in New England recording this, I would be remiss if I didn’t give a shout out to a couple people who didn’t make your list who were in that graphic, and that would be our own Chris Gabrieli in Massachusetts, and also Jonathan Sackler, who’s the heir to the OxyContin fortune. Jack: They’re in the cradle. Jennifer: They’re definitely in the cradle. Rebecca: And what’s especially, yeah, what’s especially striking is that these connections just exploded over a relatively short period of time. So when we looked at it in 2009, the connections, the spider web is what it sort of looks like, is not going to be very good at catching very many flies. There’s lots of holes, there’s lots of openings, and then just a few short years later in 2012, it’s just incredibly dense and it’s even hard to make out exactly who’s who, and all the different lines that are connecting. So it was a relatively short period of time where all of this took place. Jennifer: So the defense that you often hear is that these donors are really just balancing out the influence of teachers unions in school board elections. But one thing that really surprised me about your research is that unions aren’t necessarily as involved in some of these local elections as we might expect. Tell us more. Rebecca: Sure, it has long been assumed that the teacher’s union was the most influential interest group in local elections, partially because they’re relatively small cost, they’re not held at a regular time, which enables these interest groups then to, for very little money and very little mobilization, have a particularly out sized influence. And that certainly has been the case, there’s no denying that, however I think that that just sort of universal assumption as truth needs to be challenged by what we’re seeing today. These large outside donors. Because at least in the cities that we’ve looked at, union money has been significantly dwarfed by these large outside donors. And increasingly, even not just direct donations, but we’re seeing, as Jack mentioned in the opening, all these dark money donations. So more and more political action committees being set up or independent expenditure committees is what they’re sometimes called in the school board world, where there can be sort of unlimited funds and you don’t actually even know where they’re coming from. Now unions have those as well, but there’s just an explosion of these different types of groups and it’s really hard to keep track of where the money’s even coming from. Jack: So Rebecca, our listeners know that I am a big believer in Silicon Valley and its power to completely transform education through some common sense thinking. The channeling of big dollars into schools to finally fix what these rotten teachers have been doing. So my question, then, is given my ideological bias in that direction, who cares if the money comes from outside? Reed Hastings and Laurene Powell Jobs, either create successful companies or married people who did, so they’ve got good sense. And so who cares if the money for school board election, school board elections is coming from billionaires? They have the best interests of kids in mind, and they have probably chosen good school board members for us, so why should we be concerned about any of this? Rebecca: Well I think that’s the real sort of question that we’ve been trying to dig into, and I think there’s a couple of different ways that this money is important to consider. Because certainly there are some people that think these elections are national, what happens in LA public schools, LA USD, is not just about LA, it’s about sort of a larger national agenda. And from that perspective, then certainly who cares where the money comes from? But I think when you are actually the kid going to those schools, or you’re the families in those communities, I think then the perspective becomes somewhat different. We’ve heard from a number of candidates that have talked about their different agenda. For example in LA we heard from a few candidates that were very concerned with adult education because of the large immigrant population in LA USD. And the role that adult education plays in supporting student learning. Not just adult learning, but then in turn student learning, and how they could not get that item on the agenda because they simply didn’t have the money to compete. There was no conversation to be had around that issue because they just didn’t have the ability to publicize it in the same way that those that were getting the large outside donations were able to do. We had one candidate who gave the example of getting a picture from a friend of theirs on a cell phone that showed seven mailers that had been received in one day alone, and this candidate was saying I can barely raise enough money to send out one mailer, let alone seven mailers in one day. So we are concerned that this outside money has the potential to really drown out particular voices and particular issues that might be really important to the local community, but aren’t necessarily seen or recognized by this larger national agenda. I think the other thing is it impacts who can run. So if it takes this kind of money to run, you’re no longer having sort of your local person that decides, hey, I want to get into this race because I’ve got kids and I really care about the schools and I’m invested in them. You cannot run like that anymore, you can’t. I remember being a kid and my mom was a teacher, so I was involved in handing out leaflets and sending your friends and family around. You cannot run a friends and family campaign anymore in many of these places. This is big business, you need a campaign manager, you need a communication strategy manager, you need somebody who’s going to manage your online presence. Some people even hired videographers that did professional spots that could be aired or posted on your Facebook page. This is not your local sit around a kitchen table and run a campaign anymore. Jack: You know I’m wondering if there’s possibly one more reason to be concerned about this. It strikes me that big money is usually tied to fairly strong belief, into a fairly strong ideological orientation, and that the influence of big money in school board elections may be likely to increase polarization. Because you don’t see moderate individuals in a locality pouring big money into big pushes for small, incremental change. You know like, I’m more or less satisfied with the education my kid is getting and there are a few things that I would like to see tweaked. Let me open my checkbook and write a massive check to somebody who is going to run on that ticket. And so it seems like a setup that is designed to create pretty stark choices for people that are relatively antagonistic to the kinds of incremental changes that you often see local people in favor of. And equally so, then people said once they’re on the school board, it makes it really hard to cross what we would talk about in the national realm across the aisle. In this case it was often crossing the charter divide. Right, are you pro charter or anti charter, that seemed to be a refrain we heard over and over. It makes it very hard to compromise on these issues because you’re already looking ahead to your donors for the next election. And so you get I think far more conflict, unfortunately, like we see at the national level. And that’s why we’re sort of thinking about this as sort of the nationalization of local school board elections. They will unfortunately look similar. Jennifer: You also make the point that enormously wealthy donors tend to be out of step with the views of the public in these communities, especially when it comes to paying taxes. Something that they’re not so fond of and that they tend to favor a particular bundle of reforms, but be less interested in, say, things like increasing funding for public education, investing in pre-K, and I wondered if you could tell us more about that and how we know that. Because I don’t feel like that’s something that gets talked about very much. Rebecca: So there’s a little bit of research in this, of course it’s really hard because unfortunately it’s not so easy to just call up these very wealthy donors and poll them about their opinions on various policy issues. As one academic stated, their gatekeepers have gatekeepers. So this is a population that is very hard to study, and those that have gotten to it have found that they often have distinctly different views than those of us that are sort of more in the mainstream middle class America. And so the same is true in education. I think that right now we’re seeing a huge push for vouchers, a very particular type of education reform, and this is not something that I think we’re seeing overwhelming support from local communities. And I think that this is again where we see a mismatch between those that are very wealthy and those that are actually attending the public schools and using them on a regular basis. Rebecca: I think that’s generous. Jack: Yeah. Right. So I’m wondering what the alternative is to big money having a tremendous influence in these elections when we have such low levels of public engagement. You know if you had a super engaged populous that was showing up in droves to vote, I would be willing to take that as a proxy for their level of interest in the election and attention to its details, and I would have a great deal of faith in their ability to sort out what money was funding what message and then to figure out what they believed and how that fit with those various messages. With such low levels of turnout, I begin to really worry about who is voting and who is being represented here, and so I’m just wondering if you have seen this work, and by this I mean democratically elected school boards being in charge of governing local public schools. If you’ve seen this work anywhere, if you’ve seen models for running better elections or for structuring school boards in a more effective way. If there are any alternatives to what seems like a kind of foregone conclusion that we’re going to see big money dominating these really vulnerable local elections. Rebecca: So first I would say that some people have really, as you talked about, engaged and read and become very familiar with where this money is coming from. And those candidates who have received the big money have not always won, so maybe there’s hope at the local level for folks to sort of become engaged and see. Another way to think about this is that big money is actually reinvigorating the electorate. Seeing that, hey, we need to get involved, we do need to start becoming increasingly engaged, and I think that in some cases we have seen small increases in turnout, which might actually be a good thing in the long run. I think one of the most important things that we could do to reinvigorate our interest in these local elections is have them at the same time as other elections. One of the things that historically we did for school boards was to move them away from all of the other elections, so they’re often held in the spring on sort of an odd timing, there’s not a lot of coverage of elections. Nobody’s really thinking about elections in April, and so when school districts have moved their school board elections to being in November at the same time as other state elections or national elections, you do get much more turnout as well as more attention from the media because everybody is thinking about elections at those times. So I think that is one way that we could think about increasing engagement in it. Does it work? Maybe not the best, right? It certainly doesn’t, but it’s that old adage of what’s the alternative? Is the alternative any better than what we have right now? And at least now we have the potential to becoming engaged. I think that the way we’re going we might even lose that potential, and that’s what worries me most. Jennifer: Listening to you talk, I still kind of can’t get over the fact that school board races are becoming these high drama, big money events. Rebecca, when you looked into some of these races, I’m curious if there were things that really surprised you. Did you come across anything that just made you think you know, wow, I can’t believe that I’m seeing this happen at a school board race? Rebecca: I think I’m just constantly astounded at just how much is being spent. You opened with the recent LA election, and the LA Times reported that 144 dollars was spent for every vote cast on the reform side, and then on the union side it was 81 dollars for every vote received by the teacher union backed candidate. And I just think about how much money that is, you know I would have never dreamt that there would be a 15 million dollar school board election. And so I think that’s probably one of the things that I find most surprising. Jennifer: That was Rebecca Jacobsen, she’s an associate professor at Michigan State University and studies, among other things, how school boards became the hot new accessory for big donors. We will be right back with a few final thoughts. So, Jack, I have to say that while I feel no better about the state of the republic after talking to Rebecca Jacobsen, she was a great interview. Jack: You know, I actually do feel better. Maybe that’s because I felt worse than you did going into this. You know the idea that something bad could actually result in something good, and that you couldn’t get the good thing without the bad thing I think is what came out of this for me. I of course have been troubled by low levels of turnout in local school board elections. You know, I’m then doubly troubled by the influence of big money, and particularly when that big money is dark in local school board elections that again are particularly vulnerable because of the low turnout. But I like Rebecca’s framing there that, that is so outrageous that it just might be enough to get people focused on some common sense reforms that could increase turnout, including things like rescheduling the timing of school board elections, and that could also just energize people for elections that I think they have been acculturated to think of as meaningless because in many cases they were. You know the slate of candidates running consisted of a bunch of local people who knew the schools and all wanted the best for the local kids and had fairly similar views on what that would be. And the increasing polarization around school politics, and the rise of money coming from outside, I think just might be enough to generate some local action. Jennifer: I really like that idea because what makes this topic so challenging is that school boards are such an imperfect vehicle, and you … On the one hand it does seem so outrageous that you have all this outside money, especially when you can’t track it, but then anyone who’s ever worked in close proximity to a school board knows just how dreary they can be. Jack: It’s reminding me of a conversation you and I had before we started taping this show where I don’t want elected laypeople governing the schools, but I certainly don’t want anybody else governing the schools. Jennifer: That’s a really good way to put it, and I should note that this, the suggestion for this episode, came from one of our devoted listeners. And we encourage such input, so if you have an idea for a future show that you think that Jack and I should do, just let us know. Jack: Do as the President does and Tweet it at 5:00 o’clock in the morning. Jennifer: Please, that’s when we’re most alert. And if you like what you hear, please leave us a review on iTunes, that’ll only help us expand our reach. Jack: I think that about does it, unless you’ve got 144 dollars to buy one of my votes, I’m going to vote in favor of signing off. Jennifer: And unless you were going to announce your candidacy for school board, I’m signing off. Jennifer: And I’m Jennifer Berkshire, this is Have You Heard.